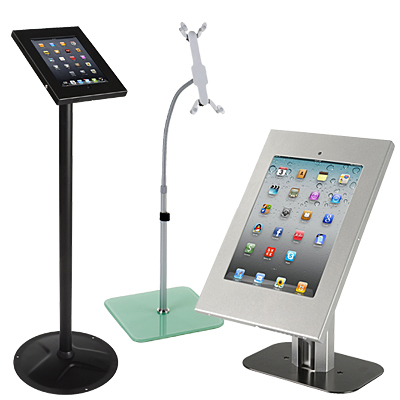 Flat screen monitor stands always enhance the presentation of any media or advertising! However, it's important to find the best way to safely display valuable LCD monitors without impeding visibility. Widescreen flat panel TVs can be prone to toppling over and becoming damaged if not properly mounted. 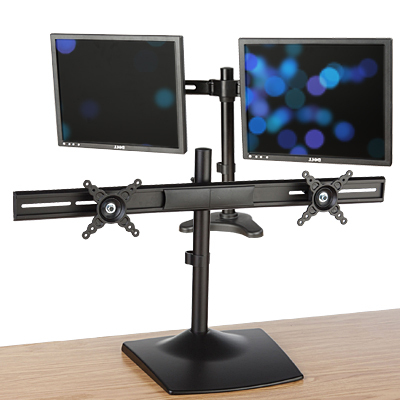 Monitor stands are tools that any LCD TV owner can benefit from because they enable you to safely and securely display video or multimedia content. How does one know which monitor stand is correct for an LCD or plasma television? All of our quality LCD mounts are VESA compatible. VESA is an abbreviation for "Video Electronics Standards Association". Television designers and plasma mount manufacturers got together to standardize the specifications for mounting televisions. Because of this standardization, customers can now be confident about which brackets they purchase for their plasma TVs. VESA makes buying flat panel mounts easier and so do we! These television stands are in stock and ready to ship! Buy yours today! Not every monitor stand is alike. At MonitorStandsNow, we supply 100s of television stands in our massive, online catalog, many of which have practical features and add-ons! Your shopping experience is superior here, especially due to our site's simple navigation links. First, decide what type of monitor stand you desire. Then, click the appropriate categories to find a television stand for the home, business or other setting and decide which features are optimal for your setup. 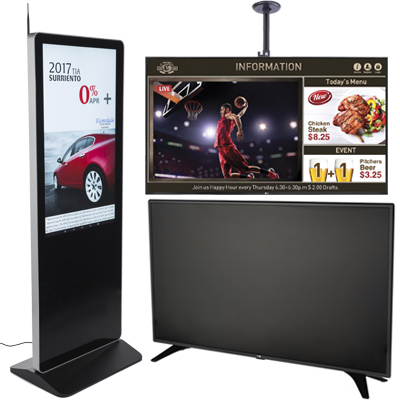 Our online catalog features wall and ceiling mounted fixtures, television stands for the home and portable stands that include digital signage hardware, as well as a commercial grade monitor! No matter what type of display mounts your organization requires, we sell it here. Start with our most popular models in the best sellers! Which LCD or plasma screen mount is best for your display needs? 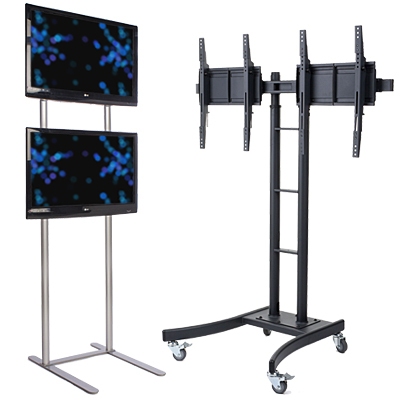 Ceiling and wall mounted monitor stands are ideal for waiting areas, lobbies, restaurants and bars where televisions must be raised up for maximum visibility. 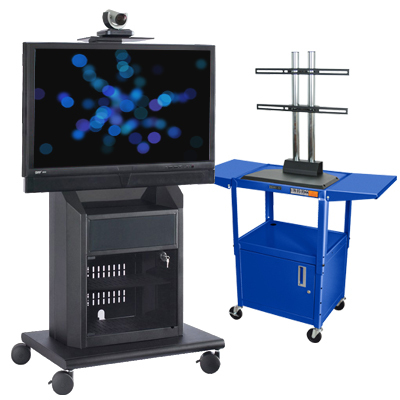 Portable television stands work well in lobbies, classrooms and are especially useful at trade shows or conventions. Temporary setups or short-term promotional presentations benefit from stands that are easily transported from one room to another. Residential styles are great for businesses and homes with sophisticated décor and plenty of available floor space. Digital signage packages are ideal for business expos, trade shows and seminars where multimedia packages help to sell your goods, services or ideas! What are the benefits every flat screen mount offers? Each item also boasts standardized VESA mounting bracket compatibility for easy purchasing and installation. Any display we feature supplies dependable support for the exhibition of flat panel televisions. All of our fixtures supply effective marketing capabilities for the promotion of goods and services. Ceiling and wall mounts are fantastic for customer waiting areas, lobbies, transportation terminals and even homes. These durable metal brackets are designed specifically for LCD and plasma televisions. Elevate your television off the floor to make more room for a special piece of furniture or equipment. Your raised plasma or LCD television will be at the optimum height for the best view. To further enhance your view, you can purchase a unit with tilting and panning capabilities. A tilt mount gives you the ability to adjust the angle of your television, which provides the best full color picture. Ceiling and wall mount television stands are typically seen in many professional, retail and educational settings. 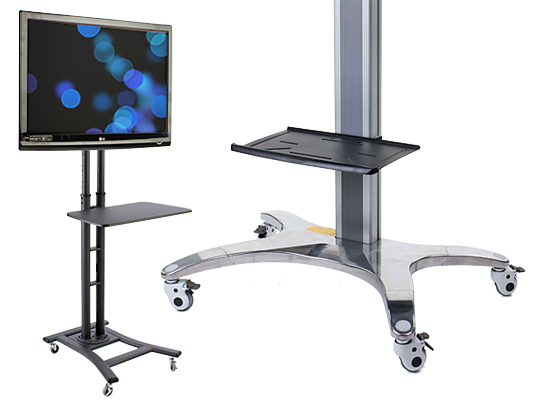 Waiting rooms in hospitals and doctor's offices can benefit from a ceiling or wall mount television stand. Restaurants, taprooms, hotels, convention centers and sports complexes all use ceiling and wall mount brackets to showcase their LCD or plasma televisions. 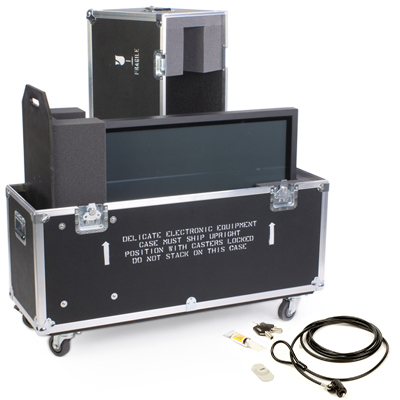 These versatile mounts can support plasmas broadcasting televised events and cable programming, or they can accommodate monitors that play commercial videos or custom advertising. Our digital signage bundles can often do both! Purchase these accessories for your home or office today and reap the benefits! Portable television stands are the most ideal displays for trade shows, seminars, classrooms and office conference rooms. They are rugged metal stands which can feature casters for easy mobility and maneuvering from area to another. 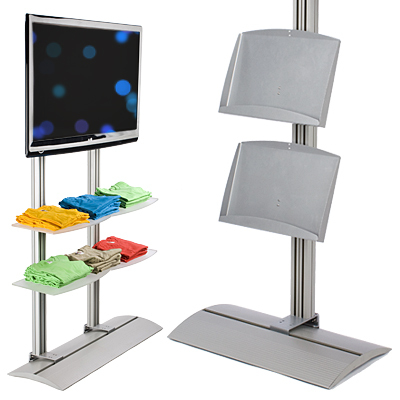 These multifaceted stands may display one, two or even four televisions simultaneously! They are the best marketing tools for use just about anywhere! Customers and passersby are naturally attracted to television messages. In fact, they are three times more likely to read a sign that features movement than they are to read a static sign! Imagine the effect your business, company or organization will have when you present flat screen televisions at trade shows or informational sessions! Check out these items and their handy accessories now! Residential style television mounts are great for homes and professional atmospheres, such as waiting areas in auto dealerships, hotel lobbies and department stores. Any location that is designed to entertain children with television may need a residential model. These beautiful television stands are constructed with tempered glass, giving them an upscale appearance and a durable construction. Featuring special poles that conceal wires, furniture style television mounts keep a television station looking neat, tidy and most importantly professional. Create a home theater with a beautiful piece of furniture that augments every décor! Digital signage packages are some of our best sellers! These bundles are each complete with a quality television stand, a commercial-rated flat panel monitor and a digital media player. These kits are powerful marketing tools that enable you to customize your message and televise the ads wherever your targeted viewers are. Order a towering, 10-foot tall unit for a crowded trade show, so no one will miss your video advertising. Purchase a subscription package to take advantage of streamed Live TV, template creation, online management and framed marketing displays! Our digital signage packages include units that are Wi-Fi enabled, models with poster displays and easy-to-use slideshow-style packages. Boost your sales, visibility and advertising potential with digital signage systems. Don't wait, order now! MonitorStandsNow.com is the leading seller of discount television stands and ceiling mounts. 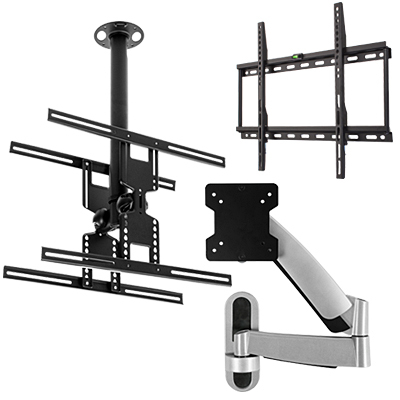 Our immense warehouse is stocked with thousands of television mounts and packages in a variety of dimensions and designs that fit every home use or business application. View our online categories for the ceiling or wall mount television stands you need at the prices you want to pay. If you have questions, we can help! While surfing online, you can participate in a live chat with one of our customer service representatives or call us at 1-800-572-2194 between the hours of 9 a.m. and 4:30 p.m. EST. If we are not open, simply send us an E-mail, and we will answer your questions as soon as we can. With the largest fully-stocked warehouse in the United States, MonitorStandsNow.com is able to maintain a stockpile of our best sellers, as well as most of our items in general. This huge warehouse ships these in-stock items fast! To accommodate our customers, we list the available supply of each catalog item to make it easier to know how many of each item is available for order. Start shopping online! Most in-stock orders received before 1 p.m. EST are shipped out the same day! Now that's service you can count on! 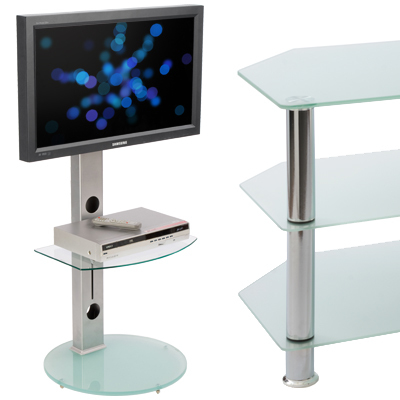 Order your flat screen plasma or LCD television stands today! Check out our site directory for a complete listing of shopping categories.